The story of my story of this story goes like this. I was at work. At the bookstore. Because I work in a bookstore. Until tomorrow. Because I'm moving overseas. That, however is a different story. Anyway, there I was selling books and what not when a strange looking book arrived to sit on the counter. People kept picking it up and asking me if it was any good. I said "it won the Man Booker International Prize". They put it down. Hmm, I think to myself after a colleagues tells me she really wants to read it but doesn't really know what it's about maybe I should read the blurb. So I do. Then I read the first page. Then my big boss comes in. Ooops! I am already intrigued and in too deep. I ask my boss if I can take home a readers copy. She says yes. I do. Nah jokes! But that is seriously a true story; they'll probably make it into a film let's be honest. Intriguing, Intoxicating and Intense. A novel that delves into one woman's choice to be different and the insanity that follows. That is the review I did for the store. You're welcome. The Vegetarian is very different. And by different I mean weird. But in a good way. 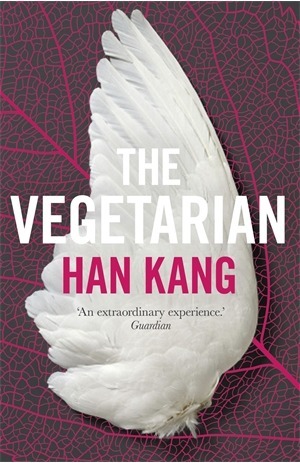 Yeong-hye is a plain woman and her disgusting husband likes it that way; but when, as a result of a nightmare, she chooses to become a vegetarian, everything changes. It didn't need to, but her weird ol' hubby and her fam bam ridicule and try to dictate over her eating habits until she goes a little (or a lot) crazy. The book is broken into three parts; told from her husband, her brother-in-law and her sister's perspective. Yeong-hye's mental and phsyical deterioration becomes quite rapid, and as it does, the pace of the book seems to slow down. The last part was actually quite dull and perhaps not necessary. I would have much rather seen a doctor's perspective. Overall I liked the book and the way it explored the extremities of mental health issues and their impact on families, as well as advantage taking on behalf of both parties.